Since I created Wartime Wednesdays three years ago, my Top Ten Wartime Tunes is one of my most popular blog posts, drawing almost 10,000 visitors. With Remembrance Day fresh in our minds, take a few minutes to walk down this musical memory lane by clicking on the headline below. This will lead to my top ten list, and you may click on each song title to hear the whole piece. WARTIME MUSIC TO WARM THE HEART! 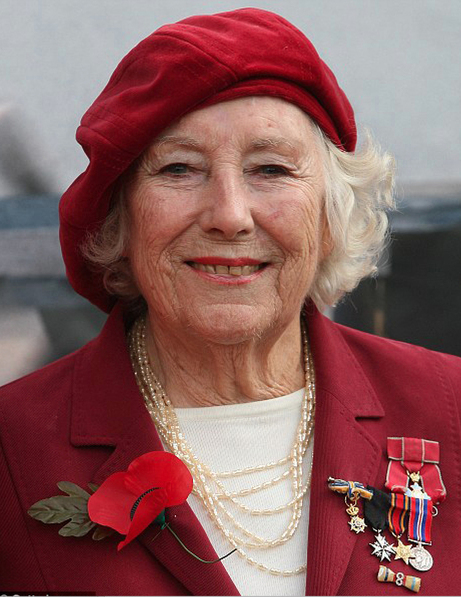 When you go to my Top Ten, you will see that the very first song is performed by the wonderful DAME VERA LYNN, THE SWEETHEART OF THE FORCES, pictured below at a recent Remembrance Day event. She is still with us at the age of 99! Here's another very special lady whom I know personally, and have written about on Wartime Wednesdays. 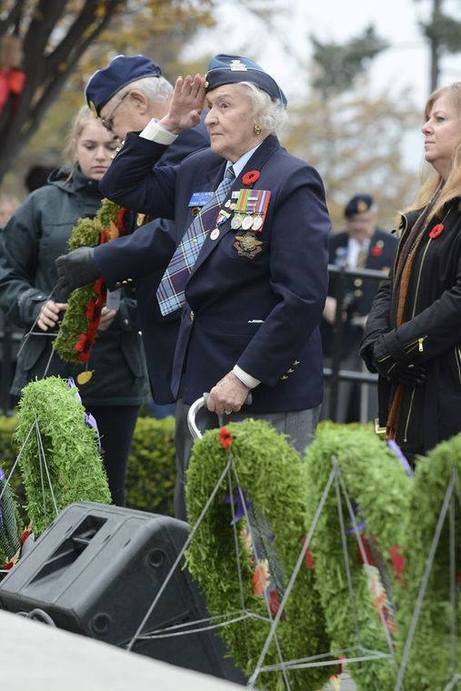 This is Eugenie Turner, pictured at the 2016 Remembrance Day service in Kelowna, B.C. in this photograph by the daily newspaper, the Kelowna Courier. Eugenie, who will turn 94 years old on November 30, 2016, served on a Yorkshire bombing station during the war, and has some absolutely wonderful tales to tell. 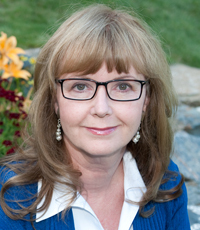 To read her story, please click here: EUGENIE TURNER. 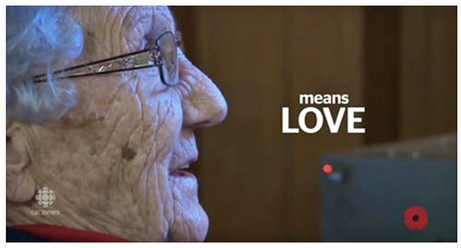 And here is the lovely Merle Taylor of Lochaber, Nova Scotia, aged 93, whom I interviewed this summer. Merle taught Morse Code during the war, and you can see a wee video clip of Merle in action by clicking this link to a recent CBC interview. MERLE TAYLOR ON CBC. You can also read my story about Merle by clicking here: MERLE TAYLOR: MAVEN OF MORSE CODE. Several special photographs arrived in my inbox this week from Roger Richer, a lawyer in Vancouver, B.C. 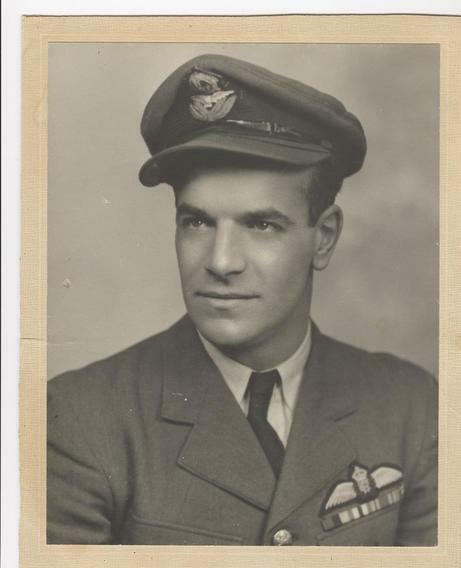 Roger's father Leo Richer flew a Lancaster during the war, and you can read his story by clicking here: LEO RICHER: A ROOKIE PILOT'S NIGHTMARE. Roger and his 13-year-old son Lukas made the trip from Vancouver down to Hamilton, Ontario, where they took a ride in one of the two flying Lancasters left in the world, the Mynarksi Lancaster, available for public flights. To make the occasion even more special, they made the flight on what would have been Leo Richer's one hundredth birthday. Leo was born on September 18, 1916 in Iroquois Falls, Ontario. Here's a photo of Leo in his pilot's uniform. I know that both Roger and Lukas were imagining what it must have been like for the young Leo, heading over enemy territory at the controls of this enormous bomber. Here's a photo of the Mynarski Lancaster, courtesy of Eric Dumegan, Canadian Warplane Heritage Museum. "My impressions of flying in the Lanc first and foremost, is what a powerful and impressive machine it is! It is not overly big compared to 21st century planes, but in the 1940s it must have been a very impressive fighting machine. “On a more personal note, I thought a lot about Dad being a 26-year-old and flying the Lanc, at night, under radio silence, without lights and in formation, being attacked by fighters and shot at by very good German gunners. "He didn’t talk about it until late in his life. He had a lot of courage, but never once did I hear him even suggest or whisper that it was anything out of the ordinary. The guys in Bomber Command were truly brave and fierce fighters, but outside of military life they were as varied as humanity itself. "Many of them were gentle, kind, compassionate, good fathers, and good companions. This is what I saw in my Dad." Here's the photo of Roger and Lukas in front of the Lancaster. This year only, the Mynarski Lancaster in Hamilton has been painted with the colours of Lady Orchid, another Lancaster that flew in wartime and was later purchased by her pilot, Ron Jenkins of Calgary, after he returned home. A vital piece of Lady Orchid wound up inside the Mynarski Lancaster, and that is why she is still flying today. Ron Jenkins himself painted the original naked woman riding a bomb and flourishing a set of six-guns! 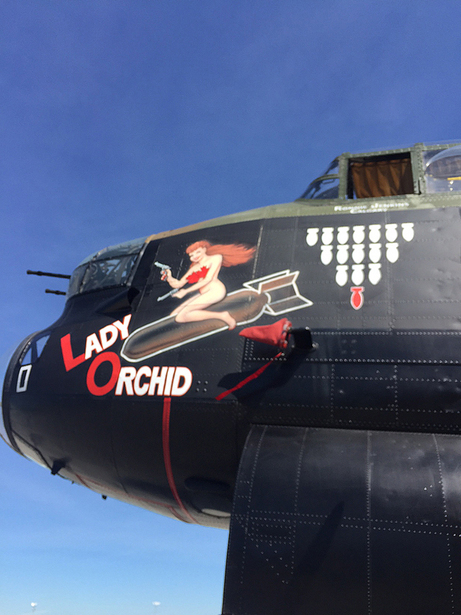 I wrote about that previously on Wartime Wednesdays, and you can read the whole story here by clicking: RON JENKINS: LADY ORCHID KEEPS LANCASTER ALOFT. 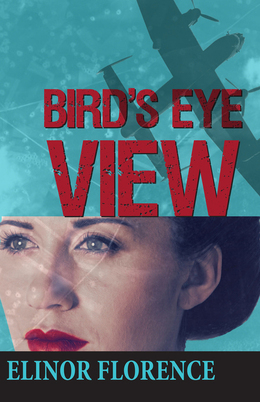 I have now collected twenty-eight original stories from Wartime Wednesdays and made them available in printed book form. All of the stories referenced above -- Eugenie Turner, Merle Taylor, Leo Richer, and Ron Jenkins -- are included in the book. To read more, click: My Favourite Veterans: True Stories From World War Two's Hometown Heroes. To order a signed copy for $35.00 Canadian, email me at elinor1@telus.net or call me at 250-342-1621. Shipping costs drop if you order two or more sent to the same address. This book would make an ideal Christmas gift for veterans, seniors, or history buffs -- and if you request, I will send it straight to the recipient. I have about 100 copies left in the first printing, so order yours today! 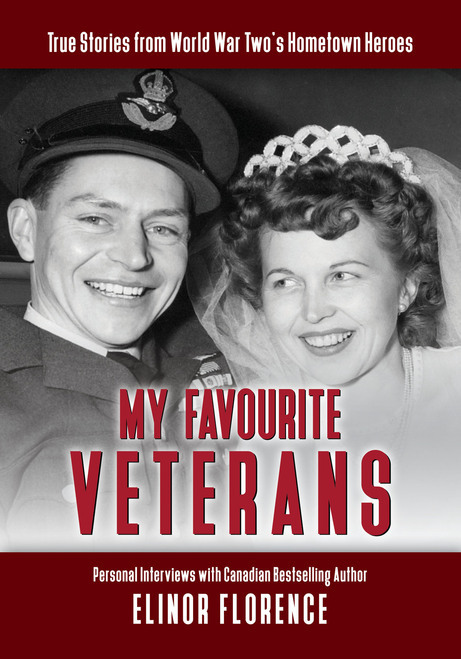 (The lovely couple on the front cover are none other than flying ace Stocky Edwards and his wife Toni, also an RCAF veteran. You can read their story by clicking here: Stocky Edwards). And to watch a video clip of me on youtube, being interviewed by Shaw Cable TV from Cranbrook, B.C., click here: Elinor on TV.